Closing date for entries: Fri 1st December, Noon. Max 2 entries per person, no backlinks. The winners of Week44 AND Week 45 are at the end of this post. Jill Tiffany - My project this time 3D i used the Winnie Wwhite Christmas Big Kahuna Download Kit and coloring Winnie with pencil color. Make my own house and use the tree from the Kit too. Judy - I have used two images from the Work & Play 5 - Festive Hollybobs Collection. to make my side step card. I coloured my images with Copics, gell pen and Pitt Artist pens. The snow was created by grading Styrofoam and added some glitter for sparkle. Helen - Time for a little more Christmas and of course it has to be Winnie White Christmas and I've gone away from the whiteness and gone into the kraft..ness. I just love the colours in this collection and I've used some pre-coloured embellies, tag, word art and paper, there's just sooo much to choose from. 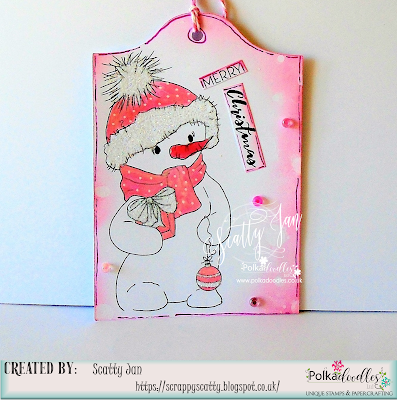 Ruth: I've gone for the Winnie White Christmas collection and used one of the pre coloured images. The colours are really soft and gentle and are also continued in the papers. I've gone for a distressed look, added one of the sentiments which I layered onto one of the papers using Pic Monkey. Norma Using Winnie Winterland big Kahuna collection I made this Advent Calendar. If you want to know a secret I love Winnie, I use a design sheet for the collection and the 25 is for the Winnie White Christmas collection. If you want to know how to make it, I will leave you a video tutorial in my blog. Just click in my name. Vannessa - I used the Octavia Frosted Winter Collection and my favourite stamp from it - Ice Queen Unicorn. I used one of my favourite colour combos - purple and aqua - for an icy wintery feel and the patterned papers in the collection were the perfect match too. 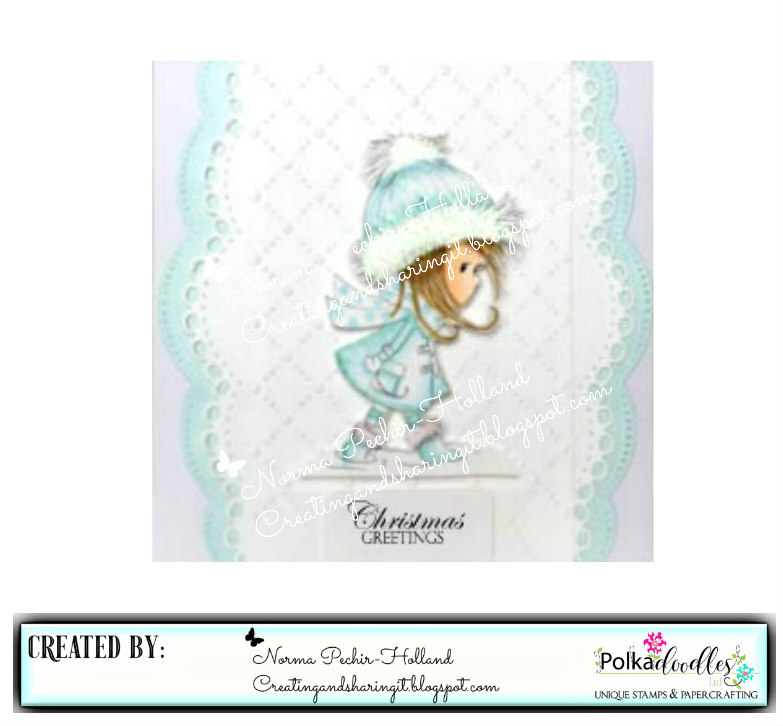 Anna - For my side step card I used the beautiful Winnie Winterland collection. I printed Frosty the snowman directly on a patterned paper and i coloured it with the Prismacolor pencil. I embellished with the various elements in the kit. 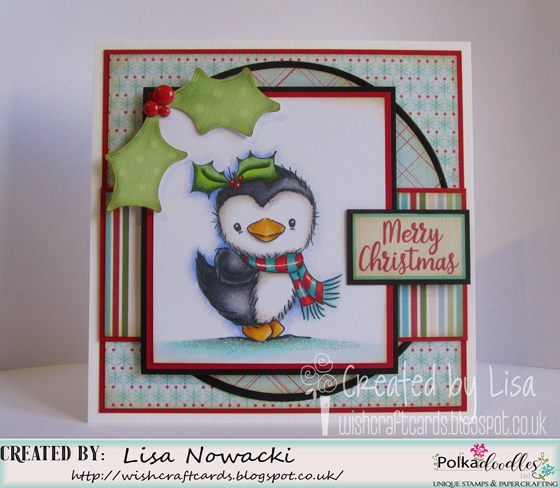 Lisa - I've used one of the adorable penguins from Winnie White Christmas, coloured with copics. I printed the papers, sentiment and holly onto linen card, added some enamel dots for berries and some sparkly glitter 'snow'. Lisa - I've used a pre-coloured digi stamp, papers and sentiment from Twiggy & Toots Festive Fun Download and the Elegant Nest Dies to make a Christmas card. Claims must be received by 30/11/17, please refer to Challenge rules at top of blog. Please email us HERE, quoting the following code PD0wk444041 to claim your prize of $10 worth of downloads from the digi store. Please email us HERE, quoting the following code PD0wk454041 to claim your prize of $10 worth of downloads from the digi store. Please email us HERE, quoting the following code PD0wk44041123 to claim your download voucher from the digi store. Claims must be received by 30/11/17, please refer to Challenge rules at top of blog. Please email us HERE, quoting the following code PD0wk45041123 to claim your download voucher from the digi store. Claims must be received by 30/11/17, please refer to Challenge rules at top of blog. Closing date for entries: Fri 24th November, Noon. Max 2 entries per person, no backlinks. The winners of Week43 are at the end of this post. Stephanie.... I've always wondered how all the creatures and characters of the North Pole lived. It's in the North Pole Cottages of course! Think of this advent calendar as a apartment complex of sorts for all the inhabitants of the North Pole. I created this adorable advent calendar using the Winnie White Christmas and Winnie Winter Land. Both kits are filled with so much holiday yumminess that it was hard to decide which pieces to use! Scatty Jan: For my card this week I have used the lovely Winnie White Christmas. I have Polychromos and Graph'It Markers to colour up alongside some glitter. 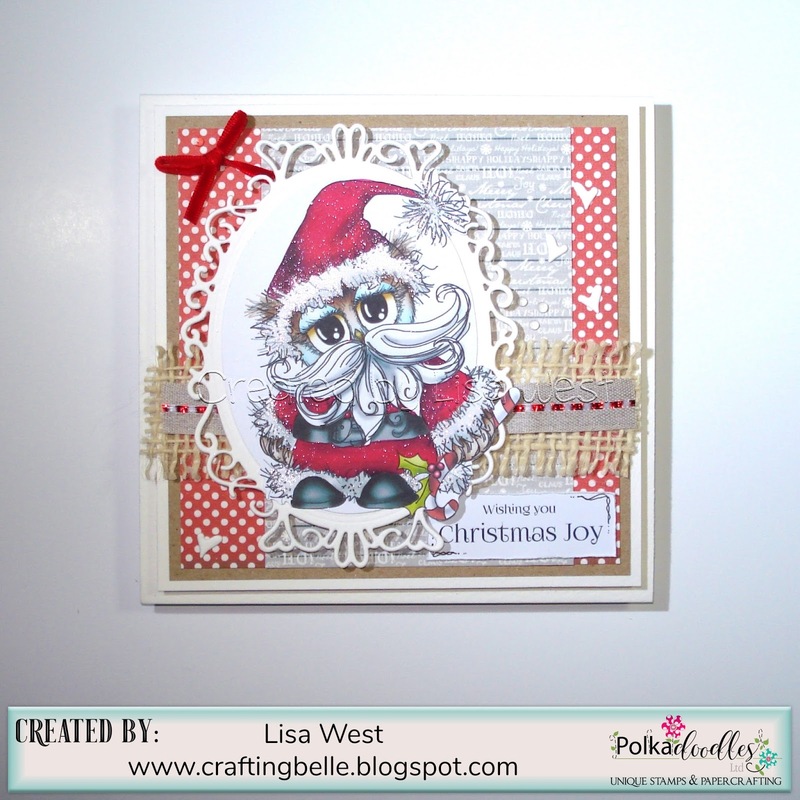 Angie J: I have used 2 of the Topper Sheets from the Winnie White Christmas Big Kahuna Kit to create these gorgeous tags. Tina: This time I pimped a candle again and used for this the design sheets from Winnie White Christmas Big Kahuna download Kit. I have printed some of the sheets on silk paper and then carefully applied to the candle with a hair dryer. 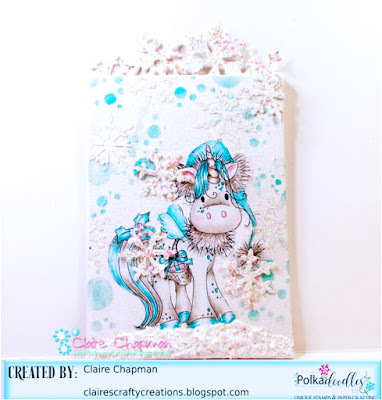 Anjie - I have used the Winnie Winterland collection, and the Polkadoodles Elegant Nest set of 3 dies for my card. A full tutorial on how I made it from scraps is on my blog. 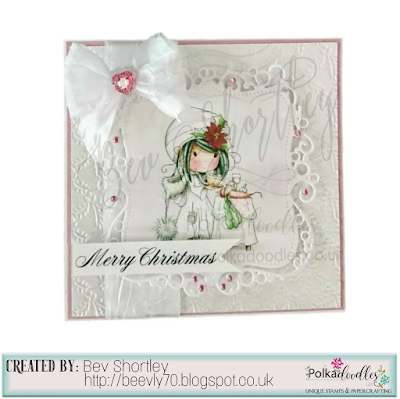 Bev here, I've been a little short on time this week so used a pre coloured image from Winnie White Christmas and cut it out with my favourite die Bubbleicious Fame. the pretty corners and some printed vellum also add a little bit of layered interest. Not forgetting, gemstones, glitter & ribbon of course. Sharon - For this week's Challenge I have used The Winnie White Christmas BIG KAHUNA Kit available here and I've used the lovely Winnie Santa digi stamp. 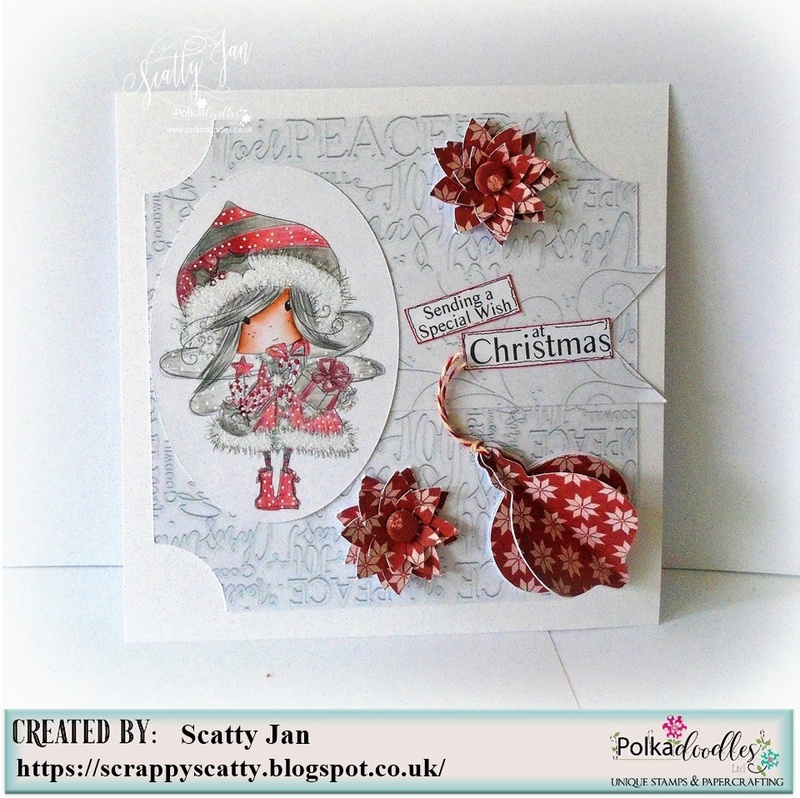 Amy This is my first challenge as part of this wonderful Design Team and I'm so excited to share my card with you. I'm using Work & Play 5 - Festive Hollybobs. This set has so much that you will love. I'm using a pre colored image, one of the fun colorful papers that comes in the set and one of the many sentiments. Hope you like it!!! Claims must be received by 24/11/17, please refer to Challenge rules at top of blog. (PLEASE ALLOW 14 DAYS FOR A RESPONSE TO YOUR EMAIL CLAIMS - we sponsor lots of challenges and we have dozens of claims to process each week which is time consuming. All claims WILL be answered within 21 days, emailing numerous times will not speed this process!). If you haven't had a reply within 21 days please resend your email. Claims must not be sent via Facebook. Please email us HERE, quoting the following code PD01wk431 to claim your prize of $10 worth of downloads from the digi store. Claims must be received by 24/11/17, please see above. Please email us HERE, quoting the following code PD01001wk43123 to claim. If you haven't already entered our Week 45 challenge it closes today, so still time to enter, but we will announce our winner next week! Closing date for entries: Fri 17th November, Noon. The winners of Week42 are at the end of this post. 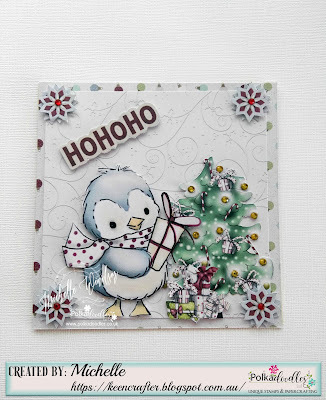 Angie J - I have used Winnie Wings from the Winnie White Christmas Big Kahuna Kit for this card. I have coloured with copic markers and added Clear Wink of Stella brush to the hat trimmings and boots for some sparkle! 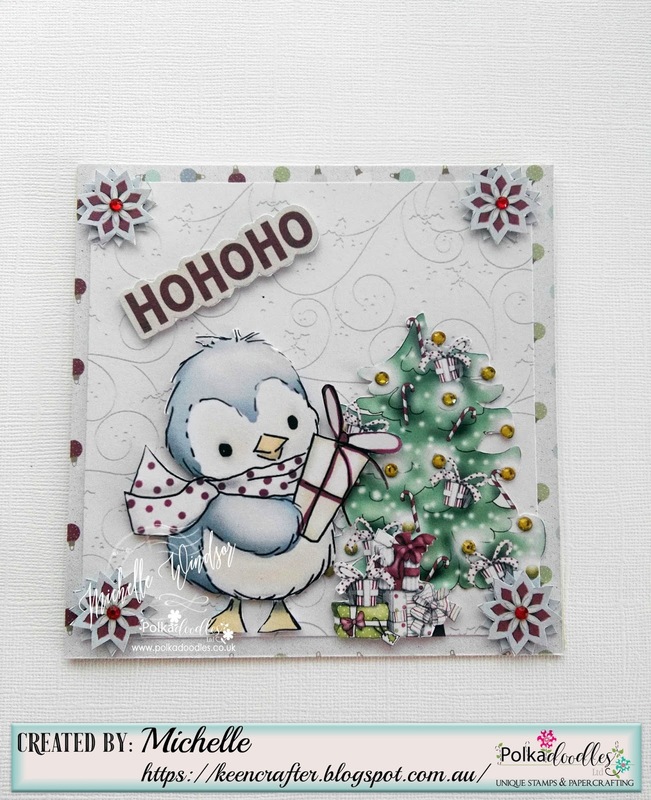 Anjie - I've used the Winnie Winterland collection for this make. 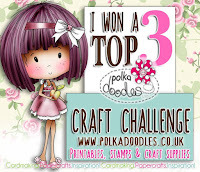 I've printed the image onto glossy photo paper and cut it out using the Polkadoodles Bubbleicious Frame die. Bev here with an elegant little 5x5 card for you. Made using a pre coloured image from Winnie White Christmas Big Kahuna Download Bundle and the gorgeous Bubbleicious Die. Tina My white card is made of glittering cardstock; so it looks like snow. The background paper is pale light blue and from the set: "Winnie White Christmas Big Kahuna download Kit"
And Winnie rolls a thick snowball. "Rolling Snowballs" Colored with Polycolor pencils from Lyra. Please email us HERE, quoting the following code PD01wk421 to claim your prize of $10 worth of downloads from the digi store. Please email us HERE, quoting the following code PD01001wk42123 to claim your download from the digi store. If you haven't already entered our Week 43 challenge it closes today, so still time to enter, but we will announce our winner next week! We don't have a winner to announce this week, but we'll announce the winner of Wk 42 on next week's post. - all super talented ladies and we're thrilled to have them joining us, make sure you check out and follow all the team's blogs for some great inspirational creative makes. Helen - Its getting closer.... yep Christmas is a coming so we need a bit of Winnie White Christmas I think. This is one of the fabulous digi images of Winnie and her winter friends, I coloured it up with copics but have left everything mainly white makes her really stand out. I used one of the lush papers as they sky and a sentiment from the collection to. Ruth: I've used Holly Sparkles Christmas Unicorn from the Winnie White collection. 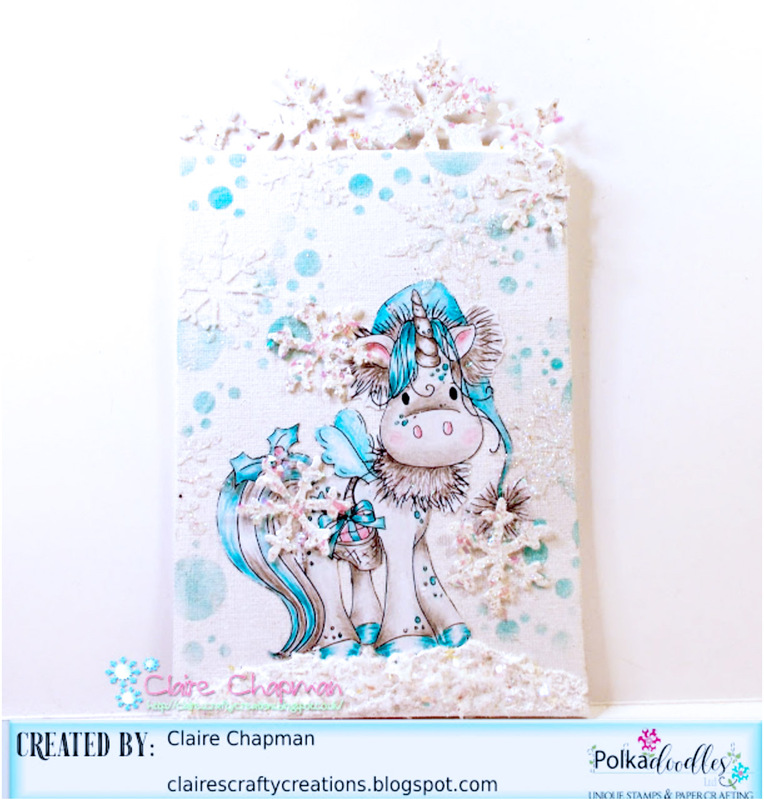 Coloured with Promarkers plus some die cut snowflakes, lots of sparkle and organza ribbons; cute! Norma for my card I used one of the digis from Winnie White Christmas, I colored her with my copic markers and I tried to make it in very soft blue, I love pastel colors. and I think this card will be perfect for my niece. 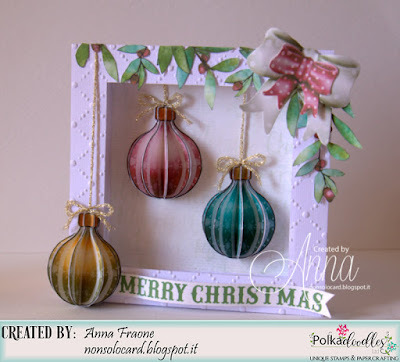 Anna I created a white shadow box and decorated it with Christmas balls that are in the kit Winnie Winterland. Each ball is made up of 5 shapes each other. I then decorated it with leaves drawn from a paper and a red bow pasted over a fine white bow. Vannessa - For my first DT project I used the gorgeous Octavia Frosted Winter Collection. I coloured the Bear Hugs digi stamp with my Copics, fussy cut it out and then added it to one of the Frosted Lands background images before mounting it onto some of the other patterned paper in the collection. Carol for my card this week I have used a lovely snowflake background paper from Twiggy and Toots Festive Fun collection. 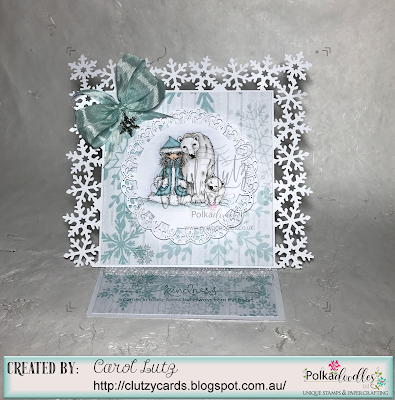 I then used Polar Family from the Octavia Frosted Winter Collection and coloured it with my copics matching the background paper colours.